It's finally summer (almost) and I am definitely ready for it. I have a baby due to pop out of me in early August and I’ve been itching to get away, even if only for a long weekend. My husband and I thought about going up to NH or Vermont, but ultimately we are water people. (So) we decided to pack up and head to Martha's Vineyard for the long weekend. If you aren't familiar with it, Martha's Vineyard is a fairly small island off the coast of Massachusetts. It was a major whaling port during the 19th century and still retains so much old New England charm. It's uber quaint, full of gorgeous old buildings, lichen covered stone walls and gnarled old trees, and of course, absolutely beautiful sandy beaches. My husband’s family has a house there, so we try to make it out at least once a year. 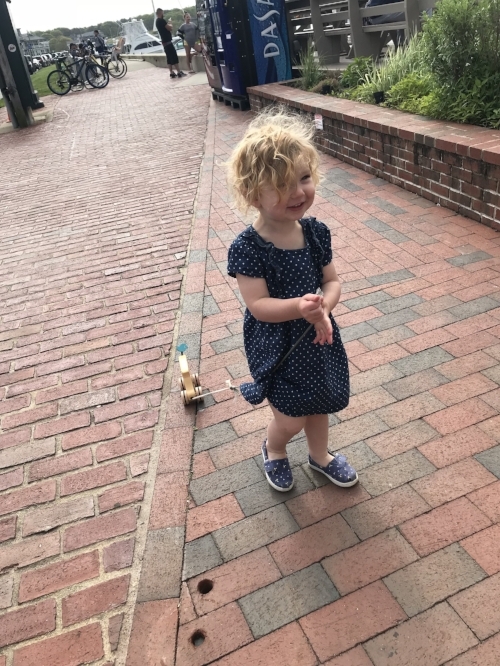 I wanted to share a recap of our most recent long weekend trip with the good vibe tribe - aka, our daughter Pepper and her stuffed animals. There are a few different options for ferries to get out there. We like to use the fast ferry out of New Bedford. It is more expensive than the Cape Cod ferry, but the parking is closer, there's less traffic, and it's more comfortable. The less traffic on the way home is really worth the extra money! There are plenty of activities in Martha's Vineyard, but the top ones have to be going to the beach and hiking. 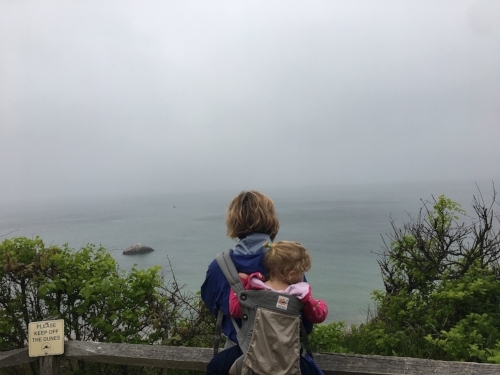 We always stay in Chilmark, so Lucy Vincent is our go to beach. The parking lot fills up fast, so we like to walk or ride our bikes down. Because it was a bit rainy that weekend, we also took our 2.5 year old daughter Pepper to visit Island Alpaca Farm - She loved it! Our second favorite activity besides the beach is hiking! Martha Vineyard has lots of beautiful hiking spots. Pepper once again woke us up early Sunday morning - but this time only requesting a banana (while doing her banana dance). We decided to go for an early morning hike at Great Rock Bight Preserve. We hiked through the fog and lichen covered trees to the cliffs overlooking the ocean, then along the beach. We were finished with our hike by 8:30 and on the way home, we stopped at the bakery for coffee and breakfast. Even though the weekend turned out to be a little rainier then we would have liked, we had tons of fun! 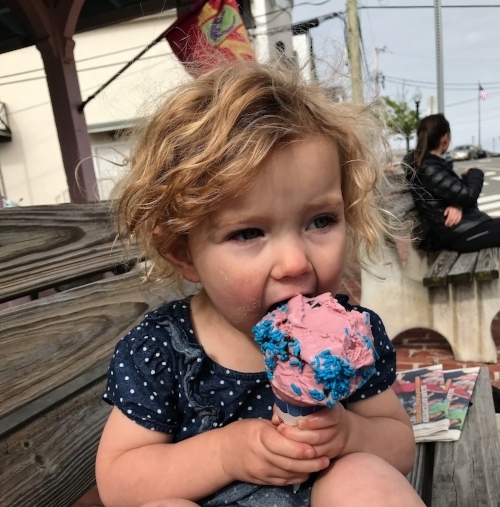 If you've never been to Martha’s Vineyard, we highly recommend going and are hoping to get back out in Sept after the baby is born. Elizabeth Stone, MBA is a Mompreneur in Rhode Island with a focus on Social Enterprises. She loves fitness and health and running around with her toddler Pepper. Her latest projects include BioSci Labs, BI Medical and Pepper’s Closet. Pepper’s Closet is a Benefit corp, helping spread ocean literacy and awareness through custom-crafted apparel. They donate 10% of all net profits directly to ocean conservation, education and cleanup efforts. Their goal is to create a movement that is as limitless and unstoppable as the ocean itself. Together, we can preserve and protect one of Earth’s greatest miracles. Support them here.